On our family trip to Toronto, we ventured to Pacific Mall, the largest indoor Chinese mall in North America. The mall has a whopping 450 stores inside and is over 270,000 square feet. One can undoubtedly get thirsty after walking around such a large the mall, so I popped by Chatime for a refreshment. 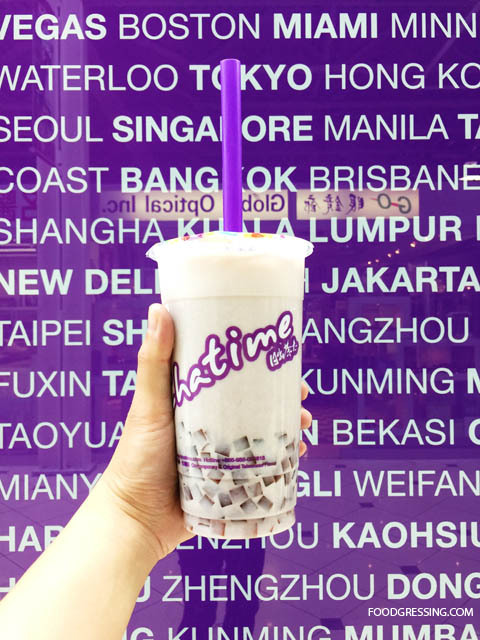 Chatime is originally form Taiwan and now has over 1200 locations worldwide including Abu Dhabi, Miami, and London to name a few. 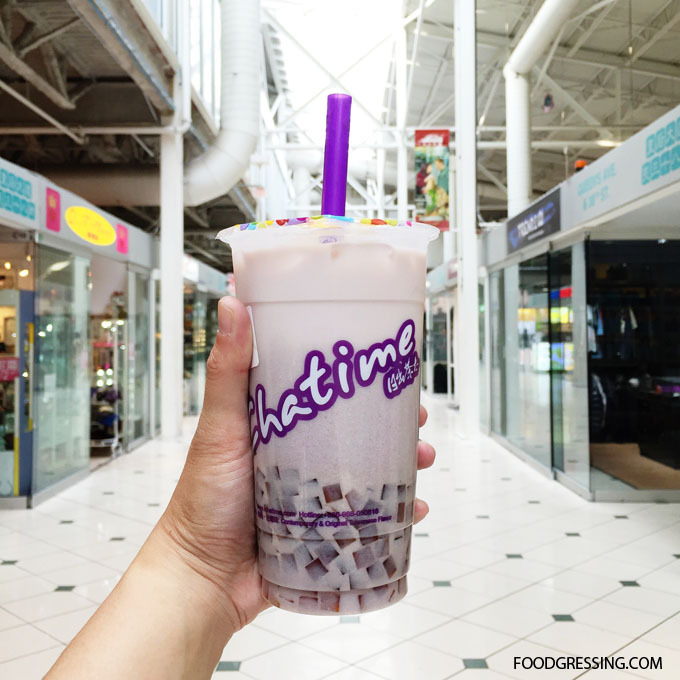 100 million cups of Chatime bubble tea are sold annually – now that’s a lot of bubble tea! Chatime has quite the selection of drinks which are organized by category. At Chatime Pacific Mall, there are Smoothie & Slush, Signature Milk Tea, Special Mix Tea, Fresh and Espresso Tea, and Mousse & Tea Latte. Drinks range between $4-$5. Zomato has decent pictures of their menu. Chatime is about making the drink right for you. You can decided on the ice level (none, less, normal, extra) and even sugar level (0%, 30%, 50% and 80%). They also have 8 toppings available at $0.50 each: pearl, grass jelly, coconut jelly, red bean, coffee jelly, aloe vera, and rainbow jelly, pudding. 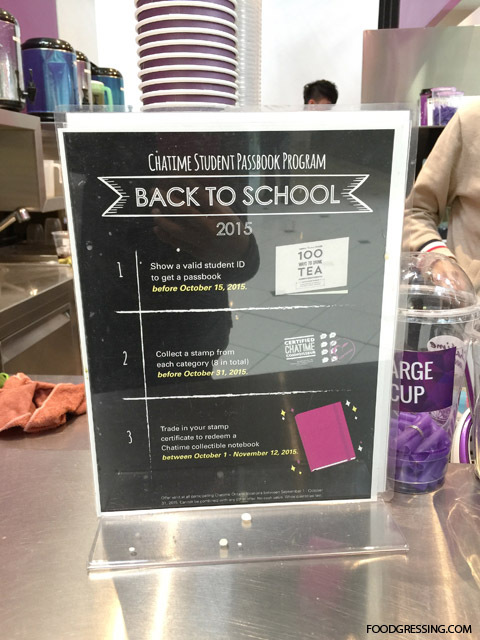 Chatime Pacific Mall seemed to be very student-friendly as I saw students with backpacks in line. 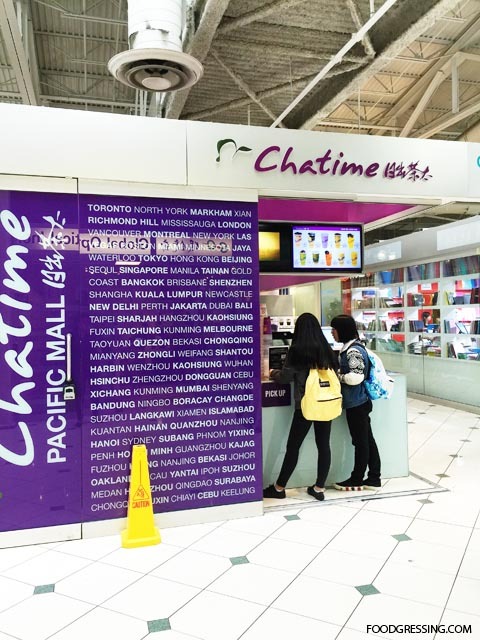 This location had Chatime Student Passbook Program where students with valid ID can redeem a Chatime collectible notebook once they order a drink for each of the 8 categories. This Chatime booth also seem to be staffed by students. The service could have been a bit friendlier. On that day, I ordered a large taro milk tea with coffee jelly, which was light and refreshing. I really liked the fine texture of the grinded taro flesh. The coffee jelly didn’t have much appeal unfortunately. It is simply less fun than the chewy and sweet pearls. I decided to not order coffee jelly again in the future.